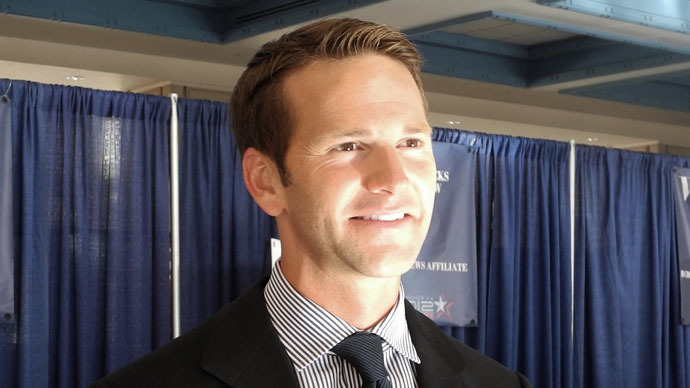 Jet-setting Congressman Aaron Schock resigned Tuesday as his big spending habits came under increased scrutiny, but perhaps more than any legislation he helped pass, the Illinois Rep. leaves an absurd and lavish lifestyle in his wake. Since being elected to the House of Representatives in 2009, Schock was considered a promising up-and-coming voice of the Republican Party before news of his resignation hit, though he was even more well-known – online and on social media, at least – for his penchant for styling his congressional office after the television show ‘Downton Abbey’ and posting silly pictures on Instagram. Since announcing his resignation, Shock has blocked or removed many of the photos he originally posted on Instagram, though a few remain spread across the internet. Here are just a few of the few spectacles Americans got to enjoy during his tenure in Washington, DC. It may seem farfetched that a lawmaker would redecorate their office to look like a popular television show, but that’s exactly what Schock was found to have done earlier this year. A Washington Post reporter first discovered the lawmaker’s bold red outer office – adorned with gold sconces and black candles, no less – in February, then discovered the whole design was inspired by a PBS period drama. “It’s actually based off of the red room in ‘Downton Abbey,’” a woman in the office told the reporter, before another woman offered to show her the inner office – also covered in red and featuring a mirror with an eagle placed on top. Although Schock didn’t want to talk about the office, follow-up reports stated the redesign was done using taxpayer money. The lawmaker ended up repaying some $40,000 to the government. Schock’s penchant for social media is well-known, and he regularly used Instagram to share his adventures with followers. From selfies with pop sensation Ariana Grande to photo ops with singer and musician Steve Tyler, the lawmaker was happy to show off whose company he was in. He even had an opportunity to meet with Pope Francis, during which he showed the Pontiff another Instagram post, according to ABC News – this one taken from Schock’s visit to Francis’ hometown parish in Argentina. A podium fit for a president? In one of the stranger controversies of Schock’s time in office, USA Today found that – as part of roughly $79,000 spent on furniture alone – the lawmaker spent more than $5,000 at a podium-maker called Mulnix Industries. In a follow-up story, Buzzfeed uncovered a $5,000 podium from the same company that looks surprisingly similar to the podium used by the President of the United States. Congratulations to Peoria Christian High School Senior Faith Kim who I was proud to nominate - and who was just accepted to TWO Military Academies: West Point and Air Force. Unbelievable odds! Her grandfather, father and brother are all serving or have served in our armed forces. Impressive lady. The podium, called “The Presidential,” was “very likely” sold to Schock, the Mulnix general manager Phil Crane told Buzzfeed. Despite the pricy furniture items and interior decorating costs, Schock seems to have been primarily undone by probes into his travel expenses. According to the National Journal, the congressman accepted money from a private organization in order to pay for the travel expenses of a companion during a trip to India in 2014. The companion, a photographer, was not a staff or family member, and therefore was ineligible to receive private funds. Not only that, but Schock never disclosed that the photographer would be going on the trip to the House Ethics Committee. Just one day before his resignation, a Politico report found that Schock billed the government to reimburse him for roughly 172,000 miles traveled on via car between 2010 and 2014. However, documents signed by him reveal the car’s odometer only had some 80,000 miles logged – a vast difference that suggests the lawmaker accrued far more in reimbursements than he spent. In the past, Schock had also been tagged for spending thousands of dollars for numerous concerts, including country music shows and a Katy Perry live performance. In a statement on Tuesday, Schock announce his resignation.